Welcome back. I hope you've got a nice cup of tea and a biscuit. This isn't a short one and you may need a suitable hypo-treatment ready in case the reading sends you low! And if you don't have diabetes just grab yourself a biscuit anyway, you deserve it. First up I need to be very clear. I’m comparing an apple with a pear here. The Freestyle Libre is being marketed as a Flash Glucose Monitor that should be used to reduce the need for finger prick blood testing. It is NOT being promoted as a Continual Glucose Monitor. However…. For me the lines are a little more blurred (time for a bad Robin Thick song?) as the on screen display does show a line of blood glucose readings taken every minute and averaged every 15. It’s measuring the same interstitial fluid that my Enlite sensors use and I have to buy it privately, like I do for my CGM. There’ll be corporate and licencing reasons I’m sure for Abbott to invent this new terminology and this may become clearer over time. Or maybe it’s to make themselves unique in the market? Who knows. Either way, to me it behaves more like a CGM than a BM stick machine (off of the 80s) so my comparison is based on that. The differences may become clearer as the review progresses below. 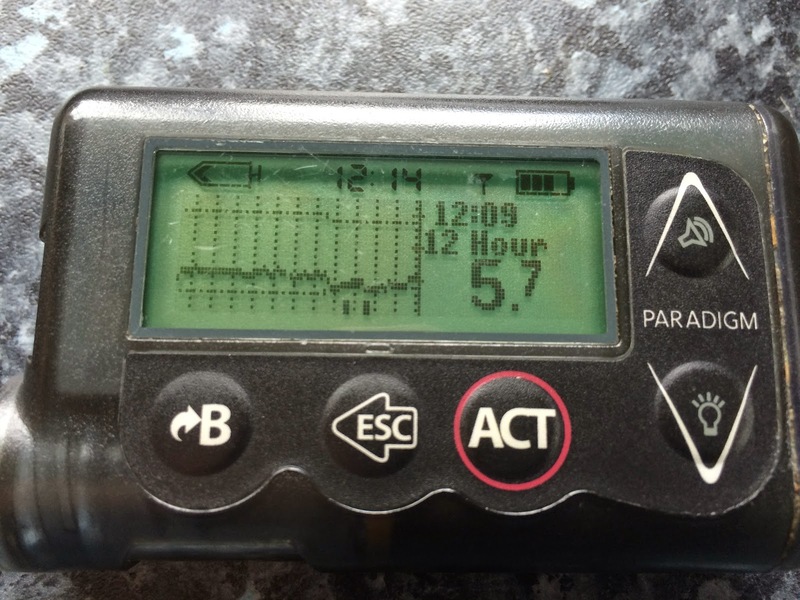 As I use a Medtronic Veo pump the Enlite sensor utilises the screen of my pump to display all readings and graphs whereas the Libre has it’s own handheld reader with display. Transmitter and charger for £490 plus sensors which cost either £275 for 5 or £525 for 10. Transmitter lasts approximately 12 months and costs £350 to replace. This is a hands down winner for the Libre. As a first time user the initial commitment for four weeks of use is £133 compared to £765 for the Enlite. Postage costs for the Libre may come into play but as these are unconfirmed and with rumours of a subscription discount these were ignored. To be clear, over £1k a year isn’t cheap but it’s certainly closer to affordable for occasional use with a lower initial outlay. As an additional point, late last year Medtronic ran a promotion where they gave you the transmitter and charger for free with your first order of 5 sensors. Then the fourth box of five was also free after paying for two more by the end of this month. Maybe this will be repeated for new customers? Calibration is done in the factory at point of manufacture. After this no further calibration is needed. After insertion the first calibration is done after two hours. This is repeated every twelve hours of use. For most accurate use it’s best to calibrate at a period of relatively steady blood glucose. Obviously this can be tricky to achieve sometimes but in reality it’s normally possible. I usually try to find a point after about 10 hours onwards. Another easy win for the Libre. The lack of any need to calibrate the sensor meant it was up to speed after one hour rather than two. As there was no need to recalibrate twice a day the challenge for finding a winner in this segment was a little too easy. 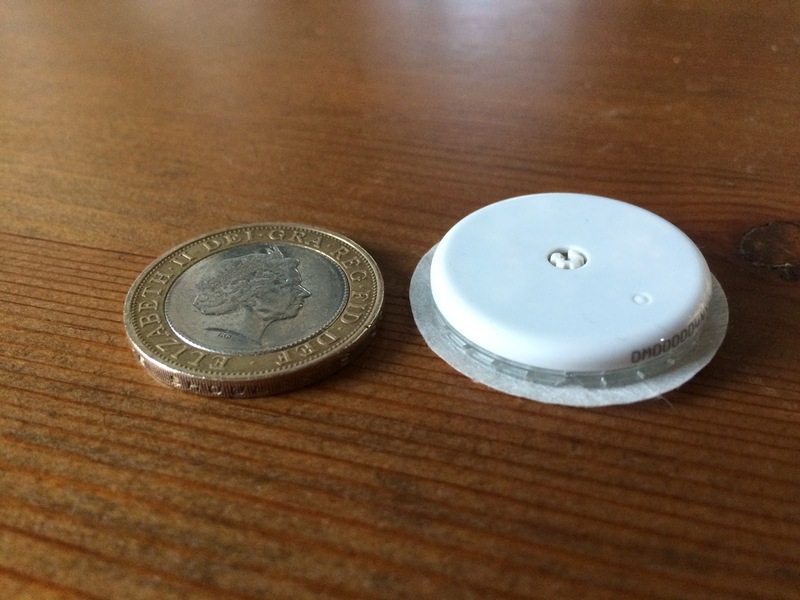 For the Libre transmitter it’s easiest to describe it as a white plastic disc approximately the size of a £2 or €2 coin. The adhesive is entirely on the underside of the transmitter and for me this held tight for the full two weeks (more on this later). The probe is underneath the transmitter and is entirely hidden. The receiver can be described as the size of a small light mobile phone with one small button on the front and a colour touchscreen display. Charging is via a supplied, detachable USB cable. The Enlite transmitter is a similar size to the Libre although about twice the height at its largest. 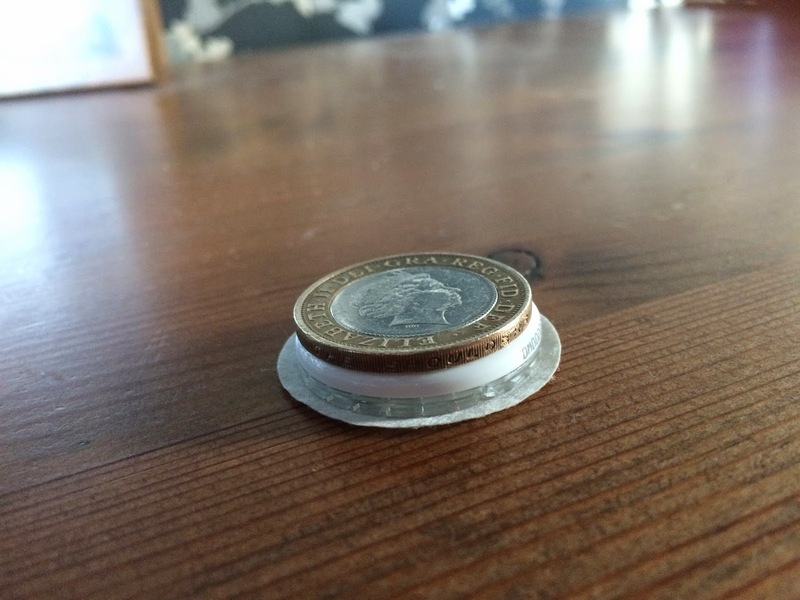 The transmitter plugs into the sensor which is underneath a small (5p size) piece of clear plastic. The whole device is then secured using adhesive tape that sticks to the body and wraps over the transmitter. In addition to this some more (provided) dressings are used to secure the transmitter in place. When not in use the transmitter ‘docks’ in a charging device so that it is fully charged when in use. As can be seen from the photos the ‘attractiveness’ of the part stuck to your body varies between the two. 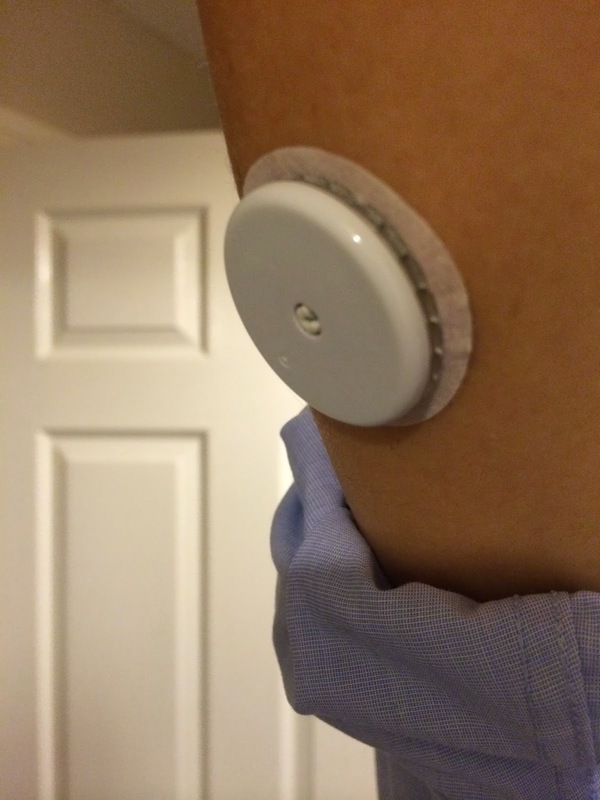 The Libre could easily be mistaken for a smoking patch and if you are more careful with its location than I was, it can be easily hidden by a t-shirt sleeve. The Enlite is slightly larger and more resembles a medical attachment. Having said that the clean lines mean it isn’t overly ugly. To insert the Libre you place the applicator on the skin and push down. The Libre is placed on the skin and a very small needle with the metal sensor filament inside goes under the skin and then very quickly out again. In a room of five people with diabetes who were trying out the sensor none of us felt any pain on insertion. It was a surprisingly pleasant experience. After this the first scan with the reader is done and a one hour countdown is started. The accuracy of the sensor for the first 24 hours is not expected to be as good as after that but I found no problems almost from the start. The biggest negative for me on the set-up was the amount of hard plastic used in the packaging and casing. This is probably necessary due to the factory calibration but it seems a little wasteful. Insertion of the Enlite sensor uses the reusable inserter. After placing the sensor into the inserter, place it against the skin, press the button, release the button and hold for five seconds then repress the button and lift off carefully. The needle is then left behind and manually pulled out after putting the inserter down. There is a slight pain on insertion that is similar to a painful injection or set change. After securing down the sensor the Bluetooth transmitter is connected and secured with more tape. The Enlite may be more environmentally friendly but sadly the slight pain when compared to the Libre again puts it second in a two horse race. All ordering for Libre is done using their online shopping site that has now gone live. You can have a look here but please come back if you click through to it! There is no need for any medical professional approval for this device. This may be because of its role as a finger prick replacement rather than as a CGM. Medtronic now have an online shop here where you can order your CGM supplies once you’ve registered with them. If you are new to CGM then you will require a letter from your doctor or nurse confirming that they are happy for you to buy the device and will provide training for the first insertion. Both systems appear easy although in fairness I have used neither. The Libre was given to me at a previously mentioned meeting and for the Enlites I’ve previously called the very nice people on their helpline. The need for medical approval means a mark off for Enlite though. 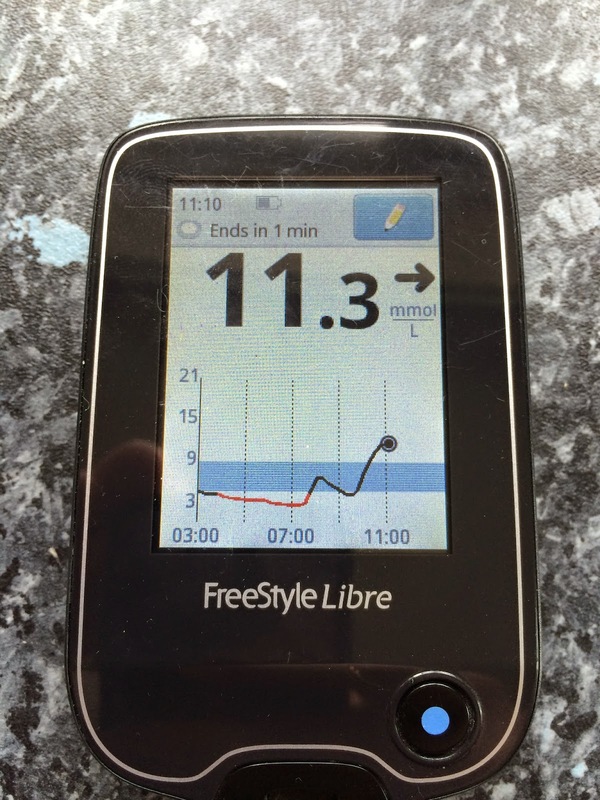 Alerts are where the Libre starts to behave like a finger prick blood glucose test machine. As it will only pass the data from the sensor to the reader when it is flashed. Any warnings of high and low are based on the latest number available. An arrow on screen will indicate if this is going up or down. Useful for easy reference. But that’s where the alerts stop. This is an alert-free machine. Step forward Mr Medtronic it’s time to earn your stripes! The Medtronic has advanced forecasting functions that work in partnership with the Veo pump. I can set alerts to warn me if my readings are dropping and rising quickly and also if upper or lower thresholds are set. Timing controls mean that during the day my lower alerts are lower than at night and my upper alerts are also slightly higher to take into account my occasionally large post meal spikes. At night I run a much narrower band as generally my levels are fairly steady when I’m asleep. Although I do not use the predictive alerts as my hypo awareness is relatively good the slight nudge I get when I hit a lower number of 3.9 is useful to just check that I’m aware of my technical hypo and am treating it. Another feature of the Veo / Enlite combination, that is currently unique, is low-glucose-suspend when a low reading is reached. This means that as well as the repeated audible and/or vibrating alarms the delivery of insulin can be chosen to suspend to prevent a person with a dangerously low blood sugar from receiving any more insulin. This is another feature that I do not use but I have spoken with others who have used it. It can be potentially useful for those who live alone and do not have anyone to check on them in the morning. The CGM features of the Enlite win hands down here. Before signing this section off though it’s useful to mention alarm fatigue. As I mentioned below I don’t have all alerts on all of the time as repeated unnecessary warnings can become so annoying that useful ones are ignored. The Libre obviously doesn’t have this problem as it requires the wearer to actively pull their readings instead of having them fed to the pump display. The software supplied with the Libre produces several useful reports to show trends and highs and lows. Abbott are promoting the use of the Ambulatory Glucose Profile (AGP) that it hopes will become a medical standard. It is also possible to download a csv file of up to 90 days readings for your own analysis. Every time the sensor is ‘flashed’ the reader downloads the latest data to add to that already downloaded. Once 90 days worth of data is downloaded it replaces this with new data. The reports that are run are based on this flashed data. When created the reports are PDF files that are created on the fly. It is not possible to create a report without the reader being connected to your PC or Mac. A consequence of this is that reports cannot be made of data that is over 90 days old unless you have downloaded the raw data and create your own reports using Excel or another piece of software. Is this a problem? I’m not sure. I’ll leave you to ponder that. The software the Enlite uses is through the Medtronic Carelink website. 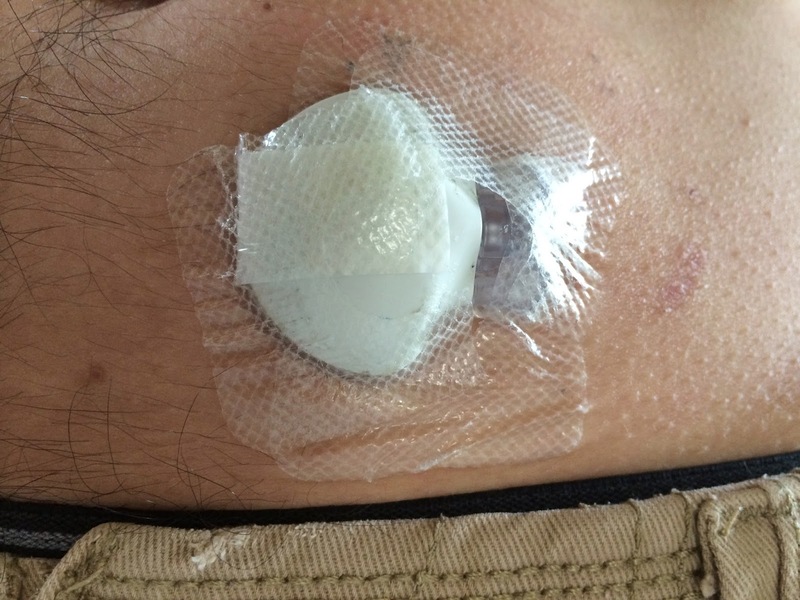 As the data is coming from the pump it can also plot your insulin usage and shows any finger prick tests taken using the Bluetooth-connected blood test machine. The graphs are all very similar but the addition of the insulin amounts showing boluses and basals is good extra feature. Once the data is downloaded it is stored on the Carelink site for a very long time (my data goes back to when I started pumping in 2011) and even if the pump is changed the data remains and carries through in to newly generated reports. The biggest downside for the Carelink software (apart from not working on Mac OS10 upwards) is that it is a reduced down version of the reports available to your doctor or DSN when you go to see them. My hospital is predominantly Medtronic and so data downloads are done when appointments happen and we analyse the detailed charts together after I’ve done a little prep beforehand using the much smaller ones. Two useful bits of software although the Medtronic option wins for storing all the data online for access at any time from any PC (or older Mac) without having to connect anything. The screen on the Libre is very nice. Full colour and touch sensitive makes using it very easy for me. How that works for those with less sense of touch or finger control I’m not sure. The figures shown after flashing are easy to read and in social circumstances it’s a very subtle process that looks like someone just checking the time on their phone. A slight step backwards here for the Enlite. As it uses the Veos screen which has been around for nearly ten years the age is starting to show. It’s a monochrome display with a background light available for when it’s dark. Due to screen size the graphs produced are relatively small and hard to read. Having said that though they can be changed to show either 3, 6, 12 or 24 hour periods and also give a hard to read indication of basal rates in those times. The key number which is the latest reading is easy enough to spot though. And here’s where it starts to get to the important bit. Accuracy has to be the key deciding factor in any comparison of a machine that tests glucose in the body. During my six day direct comparison test both machines had good accuracy for the duration. Previously I’ve experienced occasional problems with the Enlite but none of that was visible here. The difference came down to speed. For reasons unexplained by Abbott I found in this study the delay between BG readings and the number on the Libre sensor was around 7 mins with the Enlite following another 6 minutes later. It’s only fair to point out the Enlite was on my stomach whereas the Libre was on my arm. Could this account for some of the delay? Another reasoning could be the frequency of the readings. The Libre takes a reading every minute and if it’s changed since the last flash it will update the number on the screen when it is flashed. The Enlite updates the number shown every five minutes. If I’m trying to track a hypo treatment those five minutes can last a long time. 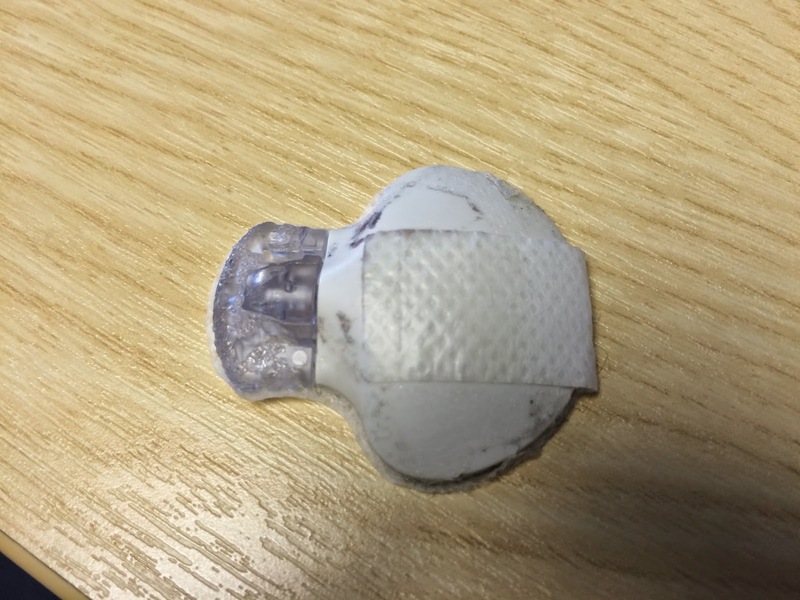 The Libre claims to have a higher clinical accuracy level than the Enlite and whilst this was slightly evident it wasn’t so much that it was a reason to doubt the Medtronic product. The winning factor here has to be the minute by minute updates that are possible with the Libre and also that, in my limited comparison, the numbers were closer in time to BGs taken to compare. As a footnote it’s worth pointing out that others using both systems have experienced occasions where there is a significant difference between the number shown and the BG taken. I can only report on my experience but I recommend reading other reviews for comparison. The convenience of wearing was a big plus for the Libre. Whilst I knew it was there it wasn’t a pain at any point and it certainly put up with a fair amount of knocks. To take a reading I needed to pass the reader over the sensor. As this can be up between 1cm and 4cm away from the sensor, wearing coats and jumpers didn’t cause any problems. Doing this in public was unnoticeable and very quick to read. The downside is that as a FGM during the night if I wanted a reading I’d need to find the reader, flash and then find the number. Not hard but slightly more inconvenient than with the Enlite. For some reason the design of the Enlite with a sensor and transmitter seems to make the device a little more delicate and it certainly doesn’t take knocks as well. A previous sensor was pushed off after only one day and I’ve only just stopped crying at the expensive mistake that was! Out and about use is really good though. The Veo looks like a pager with a wire so checking a reading doesn’t look that strange and the backlight is helpful in dark places. No need to flash means no unusual movements at all. Although as mentioned above this wasn’t really a problem with the Libre. It did win on middle of night checks though. As the Veo is a tubed pump finding it is always fairly easy by starting at the site on my body and following the tube! After that a quick button click for the light the check is complete. Much quicker and easier. All in, both were good in parts. This little beast stuck tight for me. Solid all week and it needed a good tug on day 14 to yank it off. I’m sure it would have lasted longer if the software would have let me. I went swimming and running with no issues at all. Others have experienced some problems but not for me. This has always been a downside to the Enlite. After much use I’ve now taken to using lots of clear tape on day 1 and this keeps it secure for the duration. The nice marketing pictures show a lovely stomach with only once piece of tape keeping it in place. I’d like to have seen it on day 6! A significant win for the Libre here due to only needing the supplied underneath adhesive. Available for very small children upwards after approval by their healthcare professional. It would now be easy to count the marks in each segment and declare a winner – don’t worry I will do that in a minute. But I think that would miss the point here. We’re talking about two very different systems that both manufacturers are keen to keep separate too. The Enlite does what it’s designed for very well but it’s limitations are that it needs a Medtronic Veo pump for it to be useful. But when it does have one to link to the low glucose suspend and single reader factors are huge pluses. The Libre however can appeal to a much, much larger market with MDI users being able to take advantage of the comparatively cheap option to look at basal rates of long acting insulin and also insulin ratios for short-acting. This is a huge market that CGM has always tried to get into but struggled. For me the design of the Libre is outstanding in that it doesn’t look like a medical device and can sit securely under a sleeve (if placed correctly!) totally out of site. The speed of readings is a definite plus point but with goodish hypo-awareness those six minutes become less significant although still very, very impressive. Ultimately the key factor in Veo users choosing one over the other may come down to cost. I’ve previously talked about not being able to justify funding the Enlite full-time and that’s still the case. The Libre however is teasingly much cheaper. For full time use £1200 is a lot different to £3600. I’d hoped I’d be able to get to the bottom and make a simple logical judgement on which is better. But I can’t. Yes the Libre wins by 49 points to 43 but where the Enlite wins on alerts and not needing to flash is a huge factor. So I think I’ll leave it to you to make your own mind up on what’s most important to you and I’ll lob the ball into Medtronic’s court to win me over with the new products they’ve got lined up in the coming months. PS. Thanks for sticking to the end. It was a long one but I hope you found it interesting. Thanks Dave. Are you considering investing in either of these? Great write-up Dave - full of exactly the sort of nitty-gritty detail people need. Really really useful for me to have your thoughts comparing to Veo CGM. Thanks! Thanks Mike. I consider my blog pieces as a warm-up to your literary genius. I'm really looking forward to hearing you views on wearing it for a month to see if it affected your BG testing behaviour and whether it has encouraged you to buy any more. Can you wear the new sensor on your abdomen? My husband's arms are covered by leather bands from his prostheses so he can't wear the Abbott sensor (or any other0 on his arms. Hi D. Abbott told me it was only licenced for the arm but you might want to ask them directly. They are a helpful bunch so give them a call. 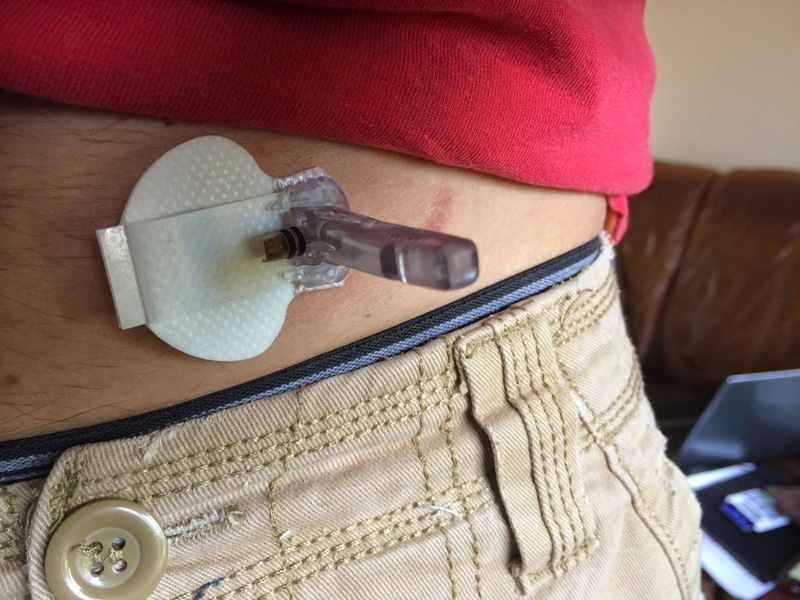 Dave, can the Libre wirelessly send the glucose test to the Medtronic Pump like the Medtronic Contour Link? Hi Geoff, sadly no. The Libre lives independently of any pump and won't transmit any data to it. The Enlite does (obviously) but again only to the Medtronic Veo pump. All these companies seem very closed when open communication would benefit us all. Can I wear a sensor for more than 14 days, or it is overridden, as in omnipod? Have you tried to restart the sensor without removing? If make reset the reader that it thinks that you have put a new sensor? Another question: is possible to switch to mg/dl units? It's only possible to switch to mg/dl if your version of the reader allows it. UK sold ones are fixed to mmol/l. Some European allow changes to mmol/l from mg/dl and some don't. I'm thinking about buying Libre, but I wanted to ask something before buying it - how does arm look when you remove the sensor? Hi Aleksandra. SOme people have experienced some minor skin reaction but I never have. I could see a small mark where the needle had gone in but this disappears in time like when injecting. The sensors used by the 640G (670G not available yet unfortunately) cost £55 per sensor and last 6 days (officially). To go with this you'll need a transmitter that costs £350 is guaranteed for 12 months. At the moment I'm using the Libre alongside my pump so yes they can be used at the same time. However to take advantage of SmartGuard you'll need to use the Medtronic CGM system. Good luck with your investigation into pumping!